This year's Consumer Electronics Show is really highlighting a fork in the road for the camera industry. The traditional camera (which has only recently become the digital camera) is being forced to evolve or die… and fast. 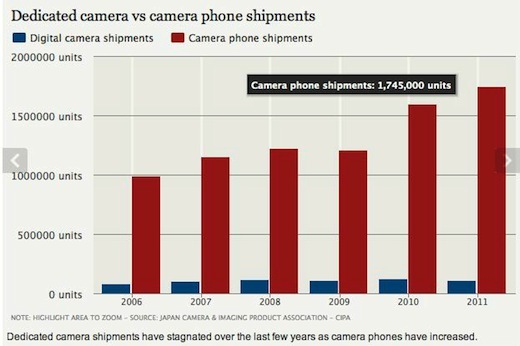 Smartphone sales are not destroying traditional camera sales, as this graph shows, but they sure are dwarfing it. Smartphones are the biggest spur for change that the camera industry has seen. At time of writing, Kodak has nearly gone bust. Kodak, the brand that popular culture used to recognise as the one that matters in photography. Also, interesting to see that Kodak is now suing Apple for patent infringement, as it flails around resisting liquidation. Among camera manufacturers, opinion varies as to how they should deal with this growing tide of phones with lenses. Basically, there's two schools of thought. "We need to make cameras that offer parity with smartphone's technological functions. Cameras need GPS, and wi-fi. Maybe even direct Internet connectivity." This route seems to be Samsung's track. "We should leverage our greater expertise in high quality imaging - smartphones can't offer anything like the same quality of image, in terms of lenses and sensors. Also, the emerging area in imaging is lower cost high quality video. Let's focus there." This route seems to be Canon's track. Both routes are interesting. Which puts greater distance between the camera industry and the smartphone industry? And which one gets the best customer approval and revenue? The invention of the camera phone is probably the most highly regarded invention of this generation. Since humans are visual creatures, the camera has been our favorite gadget to capture rare moments in our lives.